RCMADIAX Is Back And Better Than Ever! Developed and Published by RCMADIAX the developer responsible for Blok Drop U and other budget titles. 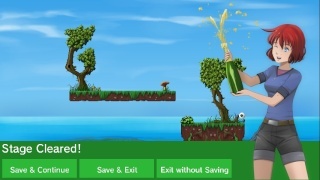 The one man developer has struggled to release games equal in quality to his first Wii U title Blok Drop U which we thoroughly enjoyed and gave a solid recommendation in our review of the game. Blok Drop X Twisted Fusion is a puzzle title that takes the Blok Drop U formula even farther and adds many new hazards. 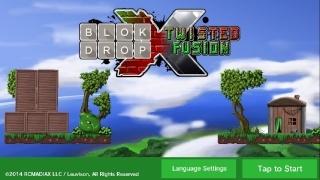 The game also possesses far more stages than Blok Drop U did which a geeat news since the lack of content was one of the biggest complaints that we had with Blok Drop U. Blok Drop X Twisted Fusion is still a somewhat short game, but it's a much better value than Blok Drop U was and will likely take a couple hours to complete! The game is also quite challenging at times which is always a good thing when it comes to games in the puzzle genre! The touch controls are flawless and easy to learn and the game also features Off-TV Play which is an enjoyable feature! The graphics in Blok Drop X Twisted Fusion are far better than those of Blok Drop U and really look nice, though more variety in the stage backgrounds would have been nice, but overall the game looks pretty good. The music is catchy while not being overly distracting and fits the game well! The sound effects are also simple yet fitting for this kind of game! All-in-all the game has a superb audio-visual presentation! With excellent gameplay, superb controls, and great audio-visual presentation Blok Drop X Twisted Fusion is a great puzzler title and is easily the developer's best game yet! We highly recommend downloading this great game! Finally RCMADIAX has released a worthwhile game lol.